No professional football player is as credited with the elevation of the NFL to the status of America’s favorite sport than John Constantine Unitas. The Pittsburgh native attended the University of Louisville, playing well enough to be drafted by his home-town Steelers in the ninth round of the 1955 draft. However, the Steelers had too many quarterbacks and released Unitas, though it was too late for him to hook up with another team for the season. Instead, he played for the Bloomfield Rams, a semi-pro team, earning three dollars each game while also working construction. This was a fairy tale in the making. The Baltimore Colts contacted Unitas in February, 1956 thinking he may be able to help their football team. The Colts had been scouting the semi-pro quarterback and were intrigued by what they had seen. 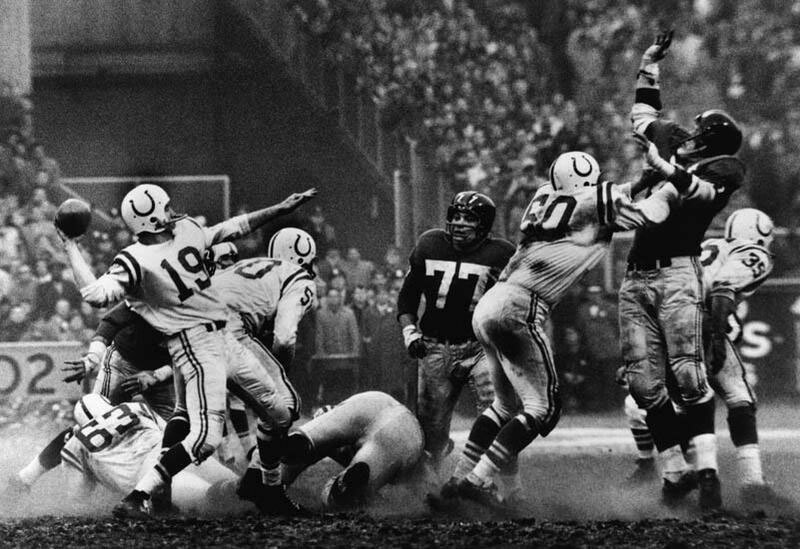 Only two years later, Unitas led the Colts to the 1958 NFL title over the New York Giants in what has been called “The Greatest Game Ever Played.” His last-second heroics that game made Johnny Unitas a household name, and his very image became symbolic of 1950s America; a masculine buzz cut and black high-tops are everlasting memories for all football fans. Not only was “The Golden Arm” a gifted quarterback, it was his courage to perform in a pocket completely surrounded by violence combined with his genius-like ability to read and understand opposing defenses that led to career marks of 40,000 passing yards and 290 touchdowns, staggering totals compared to his contemporaries. Unitas captured three Most Valuable Player awards, three NFL titles, and was a Super Bowl champion. Just as Unitas remains an icon of professional football, so too is his standing as one of the most widely and passionately collected athletes in the hobby.